American Currents is at the associate editors! Well the next issue of American Currents has gone to the associate editors. That means that it's about a month away from being in your mailbox. I've included a little content here to whet your appetite if you're not a subscriber already. If you are a subscriber, this'll get you primed for the upcoming issue. Anyway, here's a summary of the content in the next issue as brought to you via my editor's letter. I hope you enjoy! Well it seems that spring may finally be upon us! Here in Wisconsin, the snow has melted — except for the largest of drifts — the weather is in the 50s and 60s, and nearly all of the water is open. Collecting season has begun! Needless to say, I’m really excited about that! I’m also really excited about the content that we’re bringing to you this issue! Just in time for the start of the sturgeon spawning season, we bring you the second-half of Casper Cox’s article, “A Lake Sturgeon Tale” (p. 2). Also in time for the start of the spawning season, we bring you the second-half of Barry Thoele’s article “Construction Considerations and Design Specifications for a Flowing Water Spawning System for the Culture of River Minnows” (p. 6). New this issue, we bring you a press release about the improvement of the status of an imperilled darter species, the Okaloosa Darter (p. 12). 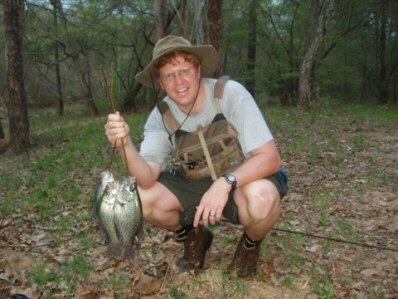 Our feature article this month, “Quest for the Orangespotted Sunfish,” is brought to us by Lance Merry (p. 14). I must say, he really has a way with words — and his photos are top-notch, too! Thanks, Lance, for a really great submission! Also this month, we bring you part one of a recap of the 2009 convention by Brian Skidmore (p. 18). Just reading and editing the article really made me wish that I had made it to the convention. Hopefully, I can make it this year. In order to prime all of us for this year’s convention, Peter Unmack has written a great article about the Nevadan desert and the Ash Meadows area (p. 23). If his article piques your interest, set your calendar for the week of October 14th to 19th, 2010. That’s when all good NANFA-heads will be meeting in the desert. Please see the article for further details. In addition to all of the great content I’ve described here, our “Riffles” section (p. 26) has some info about lamprey in the news, the Chicago locks in the news, and new and recent publications. If you’re in to taxonomy, conservation, or fisheries management, this is the section for you! Following that, our “NANFA News” section (p. 30) tells about the 2009 “Tennessee Report” by Casper Cox. It sounds like a fun time was had by all. Casper also puts forth an invitation to join him for some activities this year. It sounds like it will be a great time! Finally, we have some really great deals for you on native fish-related merchandise. On page 25 you can find out about and order the Ash Meadows DVD. I’ve personally seen the DVD and I can vouch that it’s a great video. It really gets you interested in the desert pupfishes! Also on page 25 you can read about and order the third edition of the Florida Collecting Guide. 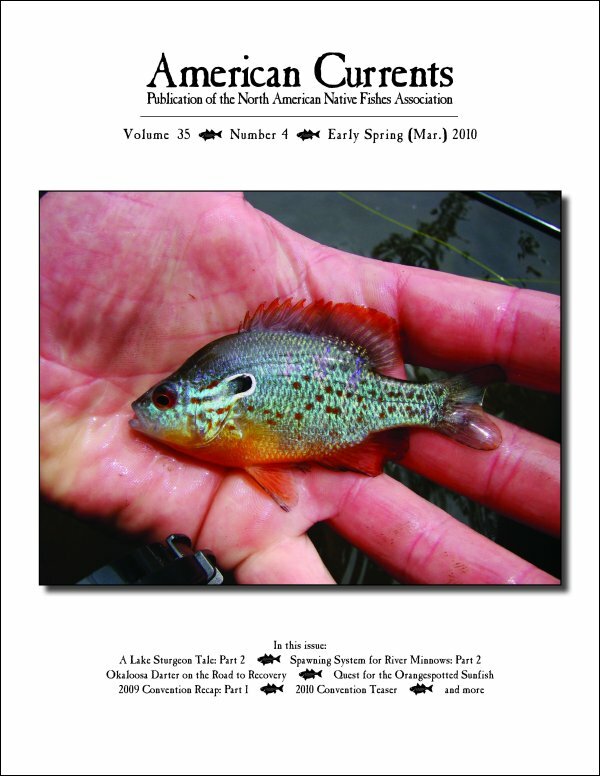 An indispensable resource for anyone wanting to collect native fish in the state, it includes such things as a review of Florida’s water resources and regulations, and how-to collecting techniques. With all of that great info — and great pictures — how can you go wrong? And here's more! The cover of the next issue. So if you want to subscribe, please visit: http://www.nanfa.org/join.shtml. For $20.00 per year (for U.S. residents), this is a real bargain! Join today! Thanks for the update Brian! Looking forward to the read. Awesome! Can't wait Brian. Thanks for getting us back on track, it is very appreciated! Awesome. I can't wait. Maybe I will get to read it when it arrives if Mr. Handsome doesn't make off with it (again)! No problem, guys! Happy to do it! Nativeplanter, who's Mr. Handsome? Last time American Currents came in, I saw that it had arrived, then it dissapeared for about a week. I think he took it to work to read at lunch, maybe. I see he has an appreciation for our native fish! Ah, I see! Those are some nice crappies that he's holding!